Updated October 29, 4:30 p.m., to incorporate comments from senior fellow-elect William F. Lee (see below). The University announced today that the two longest-serving members of the Harvard Corporation, the senior governing board, would conclude their terms at the end of the academic year. Robert D. Reischauer ’63, the senior fellow since July 2010, joined the Corporation in October 2002, shortly after the conclusion of his six-year term on the Board of Overseers, the junior governing board. Robert E. Rubin ’60, LL.D. ’01, was elected to the Corporation in the spring of 2002. William F. Lee ’72—a Boston-based intellectual-property litigator and former co-managing partner of the WilmerHale law firm, a former Overseer, and teacher at Harvard Law School, who joined the Corporation in 2010—will succeed Reischauer as senior fellow. Bob Reischauer has been a deeply dedicated and extraordinarily effective senior fellow, guiding the Corporation through a time of transformative change. His legacy, as the senior fellow who did so much to shape and implement our recent governance reforms, will carry on for decades ahead. I’m immensely grateful for his leadership, his insight and counsel, and his unwavering personal support. Bob Rubin has constantly enhanced the Corporation’s deliberations with his incisiveness, his commitment to excellence, and his rare mix of perspectives from public service, finance, and global affairs. He has been a strong voice in encouraging efforts to connect Harvard’s different parts and in pressing to assure that Harvard does all it should to assure its leadership for the long term. I very much appreciate his thoughtful, farsighted service to the University. Harvard has thrived over decades through a willingness to aim high and to embrace change. That outlook will remain crucial, as global competition intensifies and as Harvard seeks to link its schools and engage complex challenges in novel ways. I have greatly valued my time on the Corporation and the opportunity to serve an institution whose activities and aspirations represent American universities’ immensely important role in the world and the value of higher education for the individual and for society. The senior fellow: the decision that the board’s lead trustee would be chosen for the role by fellow Corporation members, rather than inheriting it through longevity, and would chair the governance committee. Thus, the on-schedule completion of Reischauer’s and Rubin’s terms, following 12 years of service, effects the new transition rule, and the selection of Lee as senior fellow makes that selection procedure a regular part of the Corporation’s processes. Reflecting on those changes during a conversation over a morning cup of coffee in Harvard Square, Reischauer said, “We now have a regularized process of service on the governing boards, so this is one more component of the governance reforms.” It had been “a smooth transition,” he noted, with “a strong consensus” on how to proceed in choosing the Corporation’s new lead fellow. Lee, he noted, is involved with Harvard in many ways. He is also, significantly, one of the three fellows on the expanded Corporation who live in the Boston area (the others are Lawrence S. Bacow, J.D.-M.P.P. ’76, Ph.D. ’78, president emeritus of Tufts University, and businessman and investor Joseph J. O’Donnell ’67, M.B.A. ’71)—a circumstance Reischauer said was “so important,” because it enables them to drop by campus, participate in activities, develop informal relationships with faculty members and deans, and, finally, to be seen by members of the community. Of the governance reforms overall, Reischauer said, “I’m very pleased with what we’ve accomplished. It has worked better than any of us had anticipated.” Despite the enlarged Corporation’s size, he said, the interaction among members is “very little different from how it was when we were half as large,” in the positive senses of maintaining collegiality and a focused sense of purpose. The inclusion of a significant number of former Overseers had contributed to smoother governance overall, and had brought members to the Corporation who already have deep knowledge of Harvard and the ways in which it is led. The committees, he continued, “are the most positive aspect” of the reforms—especially in tapping the “deep expertise” of those members who do not serve on the Corporation, thereby broadening the knowledge and perspectives available to it. Having the benefit of that expertise was also intended to enable the Corporation to spend more time focusing on broader strategic matters of importance to Harvard. “We’re doing significantly more with a long-term focus,” Reischauer said, “but we have a ways to go.” Because the Corporation meets relatively frequently (nine times yearly, rather than, say, quarterly), and acts in an advisory capacity to the president, provost, and deans—discussing difficult issues, “tweaking” a suggested direction or decision, and lending support for priorities that the president and fellows have agreed upon—“It is hard to stay out of the month-to-month issues” that arise and that might, at other institutions, be solely the purview of management. Since the governance reforms were announced in late 2010, of course, the Corporation has had a couple of significant priorities to focus on: its own enlargement and the organization of its committee structure; and the shaping of the $6.5-billion Harvard Campaign, unveiled in September. Reischauer noted that Harvard “has a sophisticated, complex way of winnowing campaign priorities”—sorting out the president’s vision, deans’ aspirations, and alumni input—and that the Corporation had played a part in the process, but without exercising “a heavy hand.” That winnowing and focusing, he said, have been a part of virtually every Corporation meeting during the past three years. Looking ahead, Reischauer said, William Lee and the Corporation will surely contend with a couple of large priorities. Teaching and learning are “going through a revolution,” he said. These matters are clearly the responsibility of the faculties and the deans, but their conclusions will “affect the shape of universities in the future in very significant ways.” The Corporation will accordingly continue to spend a great deal of time keeping abreast of the transitions and determining how the institution as a whole will have to adapt. Bill Lee’s wisdom and humanity, his blend of imagination and pragmatism, and his savvy about organizations and about people make him an exceptionally effective and admirable leader. His interests, concerns, and relationships range across the University, and he knows that innovation is one of Harvard’s proudest traditions. All of us on the Corporation consider ourselves fortunate to have, in Bill Lee, so worthy a successor to Bob Reischauer. I am deeply honored and humbled to have been chosen to serve as senior fellow. Harvard is the most extraordinary academic institution in the world, and I look forward to working with our president, my fellow Corporation members, and the broader Harvard community to ensure that it remains so. Bob Reischauer has been a wonderful leader, pioneering fundamental changes in our governance. I can only hope that we will build upon all he has accomplished. In a brief afternoon telephone conversation, William F. Lee said of the Corporation and the University today, “The governance changes that we undertook, and more importantly the implementation of those changes, laid the foundation for both the campaign and the transition announced today.” When the governance reforms were announced, he recalled, he was hopeful that they would be effective, but how they were carried out would be critical. As the Corporation’s ranks have grown, he said, the six new members “have significantly expanded the experience, the expertise, and, honestly, the judgment we can bring to bear through the collective wisdom of the group.” That resulted, in turn, in building the foundation for The Harvard Campaign, and in the Corporation’s support for President Faust as she identified and articulated the goals and began actively pursuing the fundraising effort (already successful to the tune of roughly $3 billion in gifts and pledges in the latest tally). 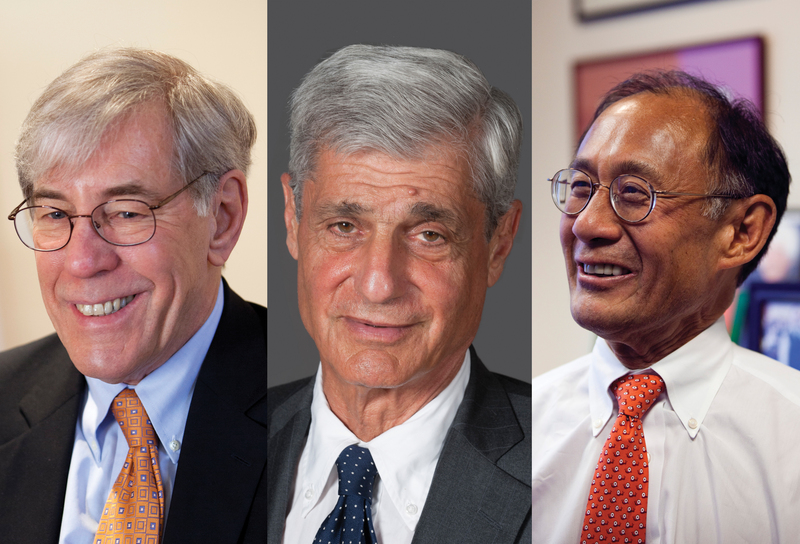 Having effected a transition in the Corporation’s own leadership with today’s announcement—which, Lee said, was a sign of the reforms’ continued successful evolution—the remaining members and Reischauer’s and Rubin’s successors are responsible for sustaining governance that genuinely contributes to the University’s success. In that light, and given the many years that Lee and Reischauer overlapped as Overseer and Corporation member, respectively, he said they shared a view of the challenges and opportunities now facing leading academic institutions. These are the themes, he noted, that Faust captured in her phrase, “an impatient future,” in her September 21 campaign address: demands for change that must be met actively. No one can confidently predict universities’ financial model and circumstances, research priorities and modes, or teaching and learning even a decade hence, he suggested. But “in an uncertain environment, we know that the mission of the University is to continue to innovate and create new knowledge” that benefits the world; to educate the finest students, both locally and far beyond Cambridge and Boston; and to do so in financially responsible ways that are sustainable for the long term. “It’s an exciting challenge,” Lee said, “and a daunting challenge,” full of uncertainties in both the world at large and within the academy. He pointed as well to “a whole lot of changes for the better under Drew’s leadership and Larry’s vision” for where Harvard should go—ideas that have, during the past decade, shaped the University’s future significantly. And he noted Faust’s emphasis in recent years on One University (fostering interdisciplinary and interschool collaborations), such innovations as the iLab, and fostering collaboration among the deans to advance Harvard’s agenda. The transition in the Corporation’s ranks, he said, had been effected thoughtfully, with members looking for what holes to fill and what strengths to add among the fellows. Today, rather than having to scramble to identify and elect a new fellow upon a retirement, there is an expectation of regular elections and retirements, so the search for candidates is continuous and orderly, with a couple of new members likely to join every two years or so. The expanded committee rosters, of course, serve as a bench and training ground for Corporation candidates. Robert Reischauer will not disappear from Cambridge when his Corporation service concludes in June. But it is perhaps worth remembering just how deep his connections to the University are. As he noted during his remarks at the capital-campaign launch on September 21, his seven-decade association with Harvard began with boyhood exploration of the campus steam tunnels from his professor-father’s Harvard-owned house on Divinity Avenue. Reischauer thought then that those tunnels were what powered Harvard, but he had come to have, he said, “a somewhat more elevated perspective” on what made the University go: the resources with which it was entrusted, and the use of those resources by the president, deans, and faculty. As a Corporation member, he applied that “elevated perspective” to the University’s affairs in what is likely to be an especially lasting way.